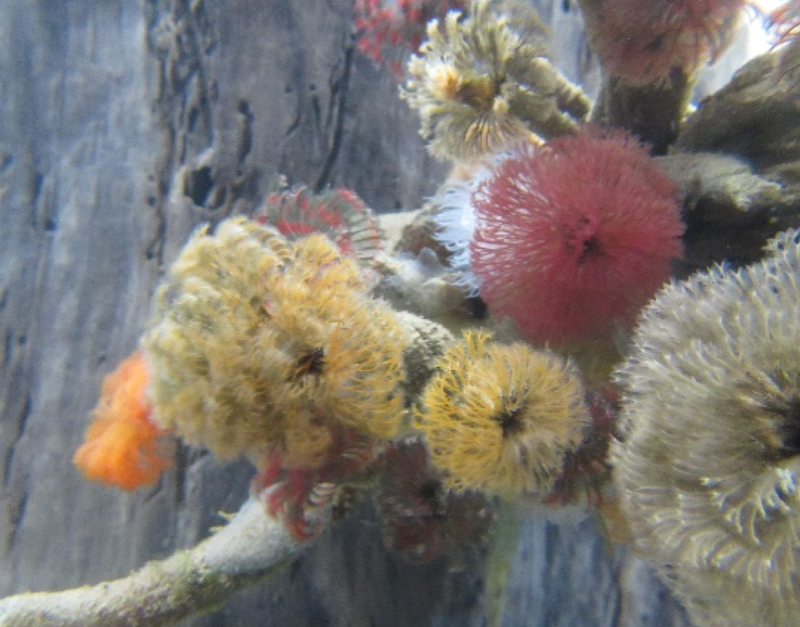 One of our tanks in the aquarium represents how animals and algae can grow even on human-made substances, such as pilings under piers. While this is true, our current “piling” is made of wood and could be misinterpreted to represent creosote-treated wood pilings. Creosote is a substance comprised of over 300 chemicals that are used to preserve the wood (read: protect it from decay, insects, etc.). There have been many efforts to remove and replace all creosote-treated wood from the water due to its terrible environmental effects. The preservative is toxic to organisms that ingest it or even live in its proximity. When the waves and salt water break down the wood, small pieces of debris containing the creosote can be ingested by the animals living around it. Additionally, the chemicals in creosote are even more likely to leach into the water when exposed to ultraviolet light (i.e. sunshine). Many organizations, including the Washington Department of Natural Resources, have made large efforts to remove all creosote-treated wood from the ocean. 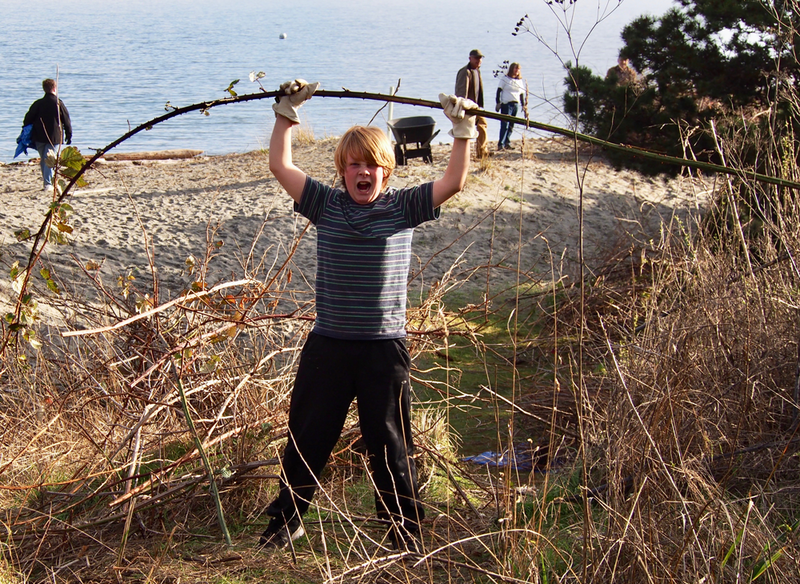 The Puget Sound Partnership was launched in 2007 with the mission of cleaning up the Puget Sound by 2020. The PSP’s Action Plan includes creosote removal because of its adverse effects on the environment. Here at the Port Townsend Marine Science Center, the wood piling in our Aquarium is, of course, not treated with creosote. However, it is slowly starting to break down, and we would like to showcase a piling that is not harmful to the wildlife, has the appropriate pH, and supports the natural animal life that would occur in our Salish Sea. with the new piling before it was lowered into the water. After a lot of research on the best method and recipe, we cooked up our own piling that we hope will fulfill our requirements! The cylinder is a mix of crushed oyster shells, concrete, and foam. We added the foam so that the faux piling would be a maneuverable weight, while still being negatively buoyant to sit on the bottom of the tank without floating. After curing for a couple of days, we tied it off the side of the pier to hang in the water. This will allow it to finish curing and maybe start growing some new small organisms before we place it into the tank. It will hopefully go into the tank in early spring! If you see a wood piling or a piece of wood that you suspect may be treated with creosote, you can report it using the MyCoast Washington website or phone app! Check it out here. We began our program with a beach walk to pick up trash. a jump rope! Staff photo. This week, the Port Townsend Marine Science Center hosted the Quilcene Elementary School through a program funded by the Discuren Foundation that allows students to receive a multi-day interactive science education program. This particular program was three days long, and we hosted a multitude of different classes. We covered topics from whales to invertebrates, and all the way to plastics in our environment. Yet, one particular class stood out to me: Salish Sea food webs. I love teaching kids about how vastly complex ecosystems are. Ecosystems are like a huge puzzle, with so many different and complicated parts, and this can make them a difficult concept grasp. This is why I love the education tools we have here at the PTMSC. We created such a fun and simple way to understand these key concepts. Salish Sea food webs began with some simple review of key concepts such as: What exactly is a model and how do scientist use them? As well as, how can we use them? Diving right into the first activity, the kids got to create a food web linking the relationships between some of the animals right here in our aquarium. AmeriCorps members, Michael Siddel and Mandi Johnson, discussing their findings after completing the food web. In order to create this, the kids had cards with the picture of an animal they could find in our tanks. 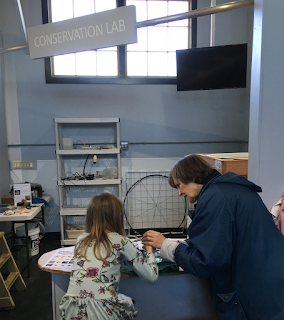 They needed to use information set around the room to find what animals they might predate on, and what might eat them. Once this was figured out, the creature was placed on the board with energy flow arrows placed between the relationships the students had uncovered. 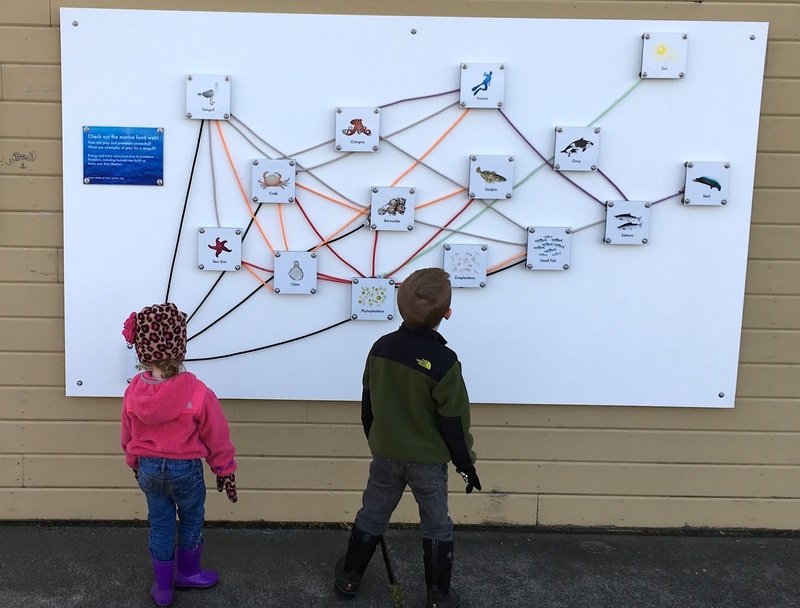 This generated a food web of our aquarium – with a few additions like humans and sea gulls, too! Generating a visualization like this shows how complicated the entire food web system is, especially considering we were only looking at such a small part. Fortunately, this lead into a discussion of how some species play a much larger role than we would have thought. Take for example, the sunflower sea star. Sunflower sea stars were shown to be important predators, which most kids found to be surprising. When we looked at what might happen to different populations if we took them out of the ecosystem, we were then able to discuss the current issue of Sea Star Wasting Disease. where their animal belonged in the food web. Staff photo. Afterwards, the class moved onto another activity. 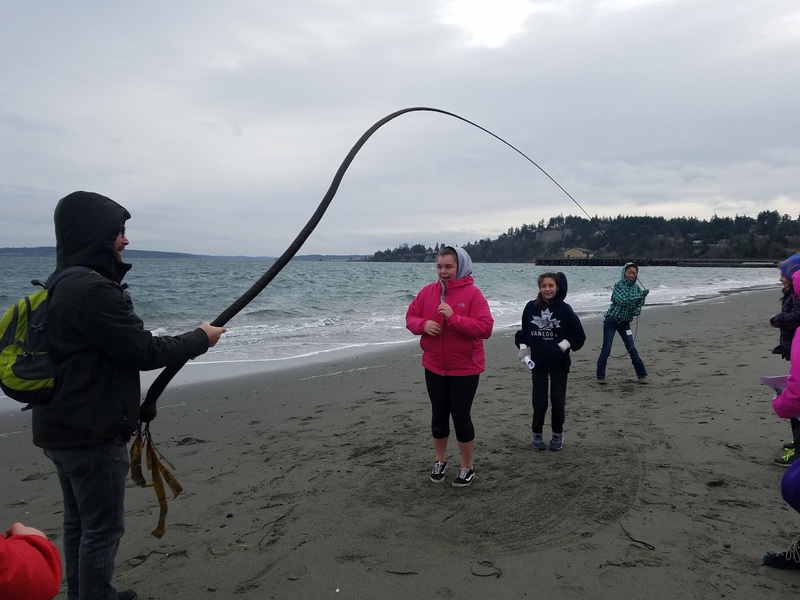 We played a game, with the students simulating a small ecosystem including plankton, herring, salmon, harbor seals and transient orcas. In this game, we demonstrated an ecosystem, with each species being able to ‘feed’ off the species they would naturally consume in the wild by collecting the contents of their stomach pouch. We continue this game until all of one species had been eaten, thus bringing our ecosystem to an end. At the beginning of each trial, as a group we determined how many of each species the next trial would begin with. Thus, giving the kids a chance to realize what a balanced ecosystem means and what numbers are needed to achieve that balance. We concluded with a discussion of "bug killer" toxins that were leached into the environment and what this means for each species. 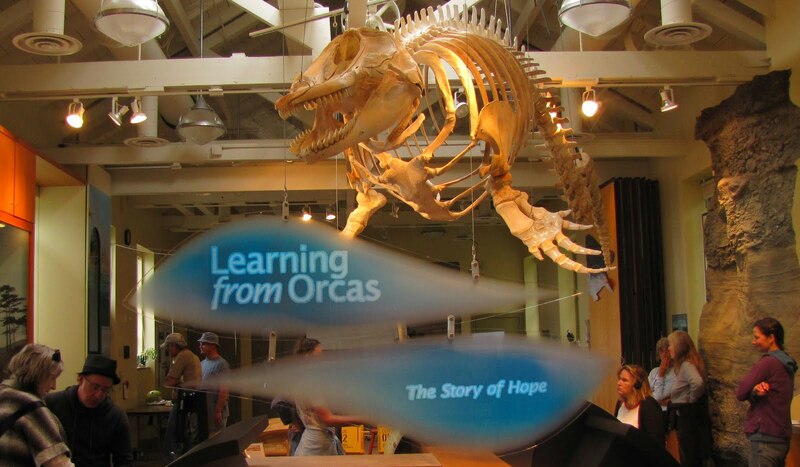 Explaining this concept of bio-accumulation helped us to relate the Story of Hope in our museum and what we can do at home to help create positive change. 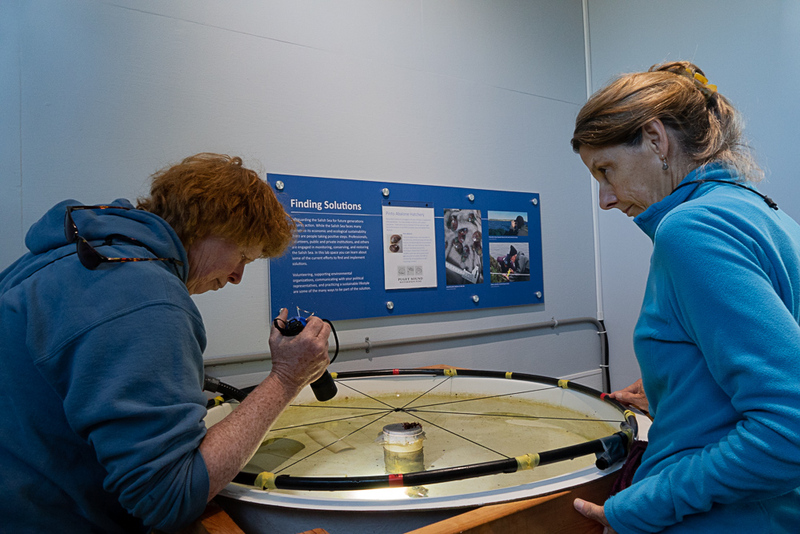 Jan Newton has for many years been observing Puget Sound and coastal Washington. She is a passionate advocate for preserving and restoring this rich ecosystem, through both State and Federal programs. Hands-on, she has harnessed a raft of new technologies to make crucial observations, sustained over many years. These are needed to understand how our ‘home’ ocean is changing, and how its health can be restored. 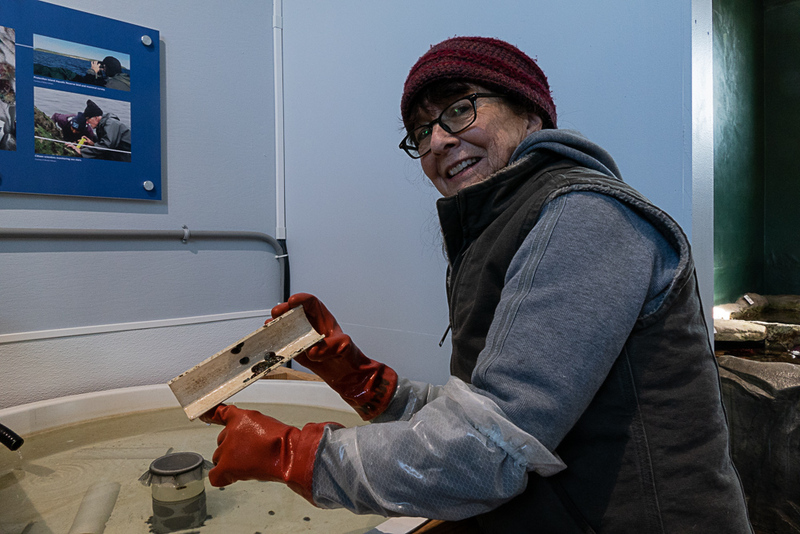 She is a biological oceanographer with the Applied Physics Laboratory of the University of Washington, currently studying ocean acidification in this region, and its connections to global climate change. 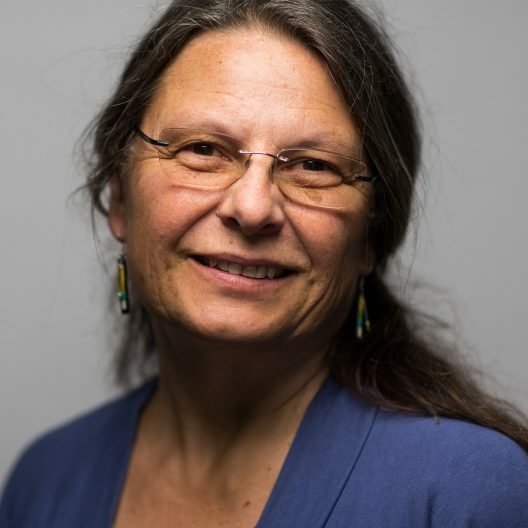 Jan serves as co-director of the recently established Washington Ocean Acidification Center, which operates from the College of the Environment, and is also Executive Director of the Northwest branch of the Integrated Ocean Observing System, a ‘mega-project’ that uses new technologies to observe the changing ocean and its human impacts. Newton is also an Affiliate Assistant Professor, teaching at University of Washington and its Friday Harbor Laboratories. This is the fourth installment of The Future of Oceans lecture series. This event is offered with generous support from the Darrow Family. 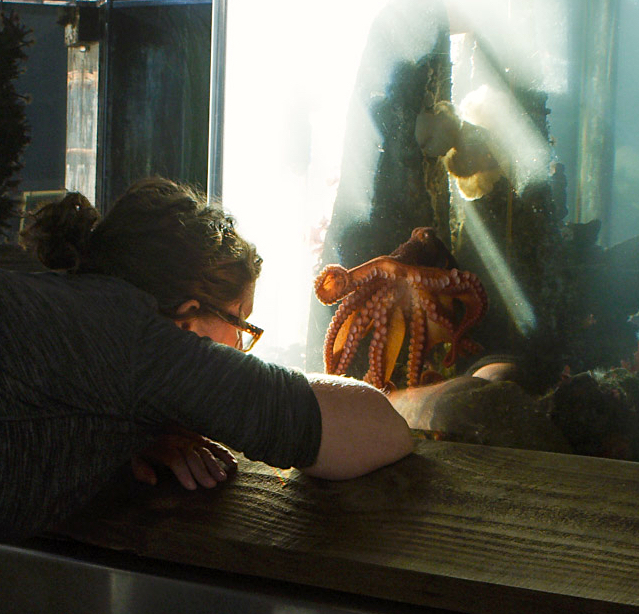 Eleanora, a giant Pacific octopus, in repose in her tank at entrance of the Aquarium. Photo by Florian Graner. Her name is Eleanora -- Nora for short -- and she is as mysterious as she is majestic, as elusive as she is enchanting. 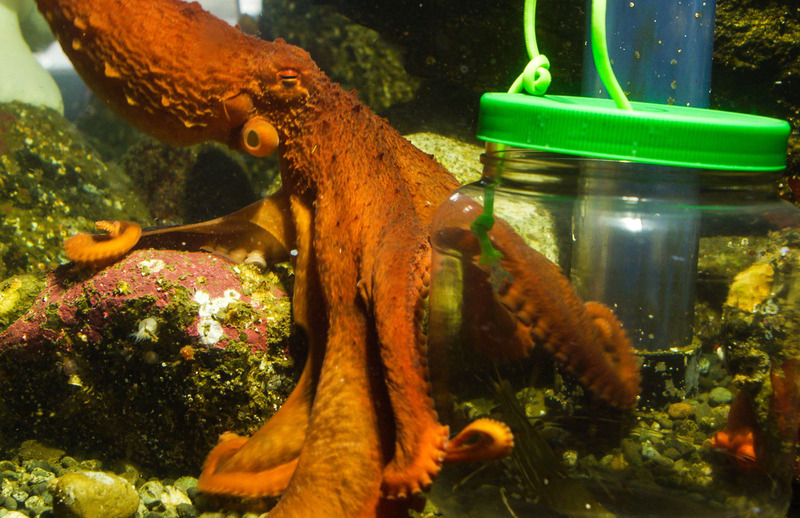 She’s a two-year-old (ish) giant Pacific octopus and, these days, the Port Townsend Marine Science Center is lucky to host her. 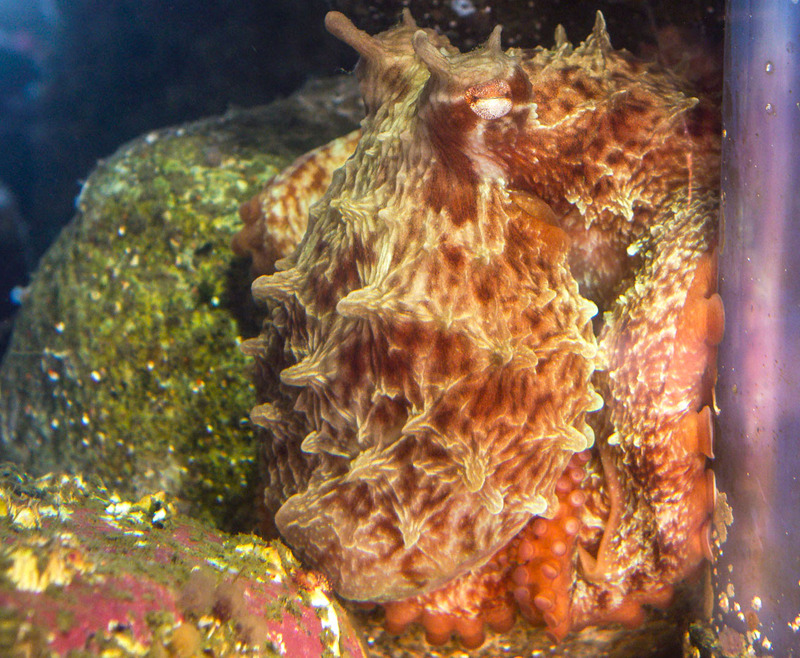 Given to the Port Townsend Marine Science Center by Friday Harbor Labs, Nora is the subject of filmmaker Florian Graner’s "Octopus Learning Project." The goal of the collaborative effort between Graner and PTMSC Aquarist Ali Redman can be summed up in three words: observe and learn. PTMSC Aquarist observes 'Nora. Photo by Florian Graner. 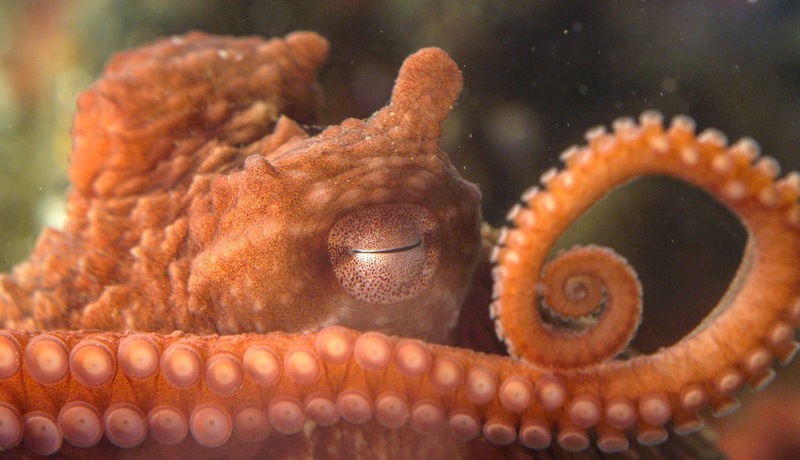 Graner, who has devoted his life to studying and filming undersea creatures, explains that the octopus is quite a reserved animal in the wild, only leaving the safety of its habitat (such as rocks and reefs) to feed. So in order to truly understand its behaviors, we need to be able to observe them in a non-threatening environment. Several times a week, Graner visits ‘Nora at the aquarium to film her for a German documentary he is producing about the giant Pacific octopus. You might be surprised to learn that octopuses are smart. Very smart. In fact, they rank among the most intelligent invertebrates in the world. Nora certainly lives up to that claim. Redman often coaxes her out of hiding with a clam in a bottle. Nora took her time warming up to the food jar with the green lid. But Nora also has a mind of her own. For some reason, she did not initially like the food jar with the green lid that Redman introduced, pushing it away and even avoiding it altogether. But then one day her hesitance vanished and she pushed the lid off so she could grasp the frozen fish “popsicle” inside. Having mastered that, Redman introduces a plastic Mr. Potato Head toy in an effort to teach ‘Nora how to open its back “flap” to retrieve a treat. Again, ‘Nora did not disappoint, billowing her large mantle out to envelop her shellfish snack before casting off the shells in a show of gastronomic satisfaction. It’s mind-boggling to see Nora change colors – one minute a deep red-orange color, the next slipping into her brownish green-gray tones as she camouflages herself against the rocks. And then there’s her “digesting” phase – a somewhat more alabaster color. She’s got the perfect “outfit” for every occasion. Octopus have an amazing ability to blend into their surroundings. Nora will eventually outgrow her tank and be released back into the wild to live out her life to the fullest. One day, she may well approach 50 pounds. But in the meantime, we look forward to watching her grow and learn, as we learn and grow from the incredible gift of her presence. PS -- Watch video below of Eleanora retrieving food from a glass tube! On December 6th, I was fortunate enough to join the Protection Island Aquatic Reserve Citizen Stewardship Committee for their 24th monthly bird and mammal survey. Beginning in December 2016, the Citizen Stewardship Committee has conducted monthly, boat-based surveys for marine birds and mammals inhabiting Protection Island Aquatic Reserve. This Aquatic Reserve encompasses over 23,000 acres of state-owned aquatic lands that surround Protection Island, a National Wildlife Refuge that serves as an important nesting area for over 70 percent of the marine birds in Puget Sound and the Strait of Juan de Fuca. A group of pigeon guillemots in winter plumage. 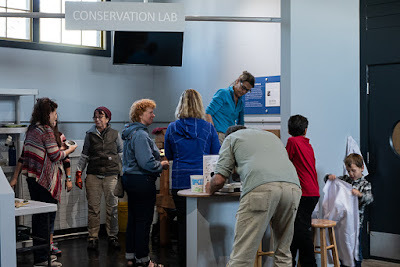 These monthly surveys are conducted so that we can better understand the population trends, diversity, and behavioral patterns of the marine birds that utilize Protection Island Aquatic Reserve. As of this last survey, the Citizen Stewardship Committee has collected two years of data, which has led to some interesting findings. 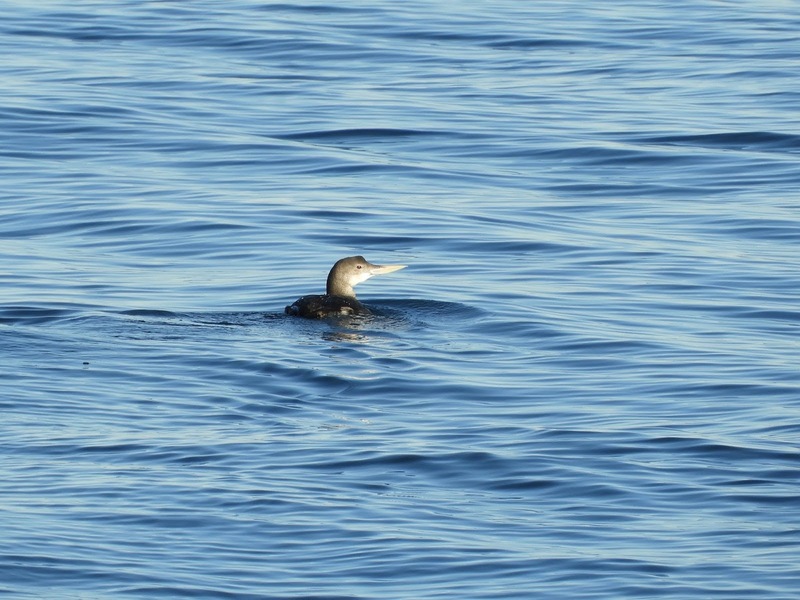 One thing they’ve learned is that some yellow-billed loons, which are more commonly found in Canada and Alaska, will spend their winters in the Aquatic Reserve. We were even lucky enough to spot a few of them! It couldn’t have been a better day to conduct the survey. The Sun shone brightly and provided some much needed warmth. There was a light breeze that rippled the otherwise calm ocean water. Visibility was seemingly limitless, as we weren’t able to count the number of mountains in sight on one hand. In addition to the rare yellow-billed loons, we were treated with a fantastic array of birds and mammals. 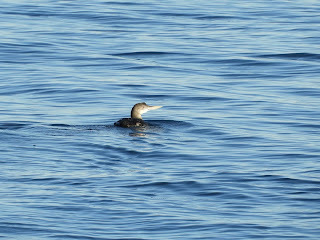 Most of the birds we saw included common murres, pigeon guillemots, glaucous-winged gulls, and mew gulls. However, we also spotted harbor seals, harbor porpoises, surf scoters, white-winged scoters, buffleheads, red-breasted mergansers, ancient murrelets, and even the threatened marbled murrelet! I’m grateful to the Protection Island Aquatic Reserve Citizen Stewardship Committee for letting me be a part of this valuable survey. I’m eager not only to visit the Aquatic Reserve again, but also to see what new things we can learn from this survey in the coming years! (Left to Right) Bob Boekelheide, Michael Siddel, Steve Grace. This is Part 2 of a two-part series, To read Part 1, go here. 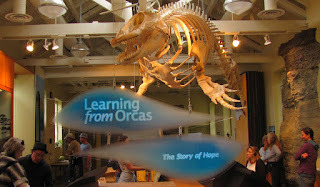 Port Townsend Marine Science Center Aquarium. Staff photo. Kelp forests are large collections of kelps -- large brown algae seaweeds -- growing vertically from rocky substrates at depths of 20 to 210 feet. Giant kelp forest, photo by NOAA National Ocean Service. Found in cool, temperate marine waters, these diverse and dynamic communities are comparable to coral reefs and rainforests. 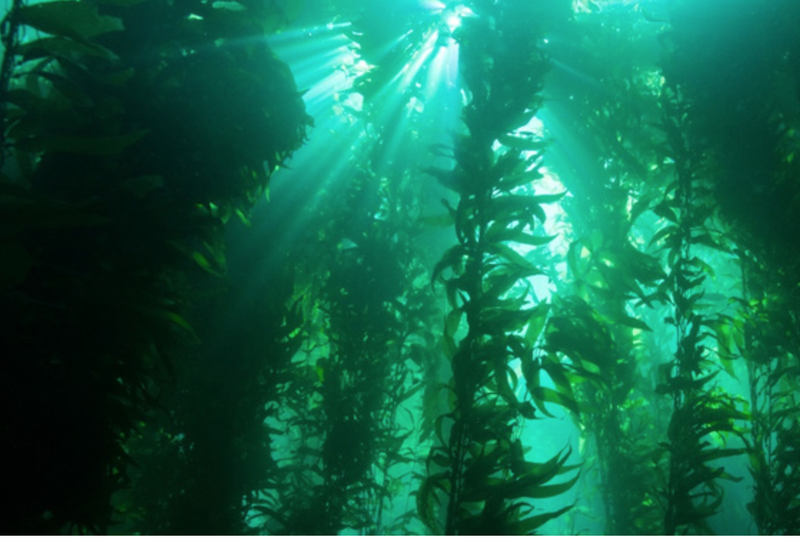 Beneath the surface, kelp forests provide a protected habitat by slowing wave action and currents so animals can rest or hide. At least 26 species of kelp live in the Salish Sea. Among the most distinctive kelps is the canopy-forming giant kelp, with buoyant bulbs and blades that can be seen floating on the water’s surface. This plant, which grows up to 10 inches per day, can be as much as 100 feet tall, anchoring itself to a rocky surface with a holdfast measuring over 12 inches across. Found in intertidal to subtidal zones, it prefers semi-exposed habitats and rough-and-tumble, high-current areas. 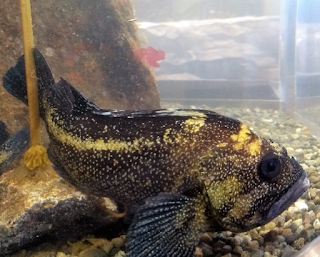 China rockfish in PTMSC tank. Staff photo. 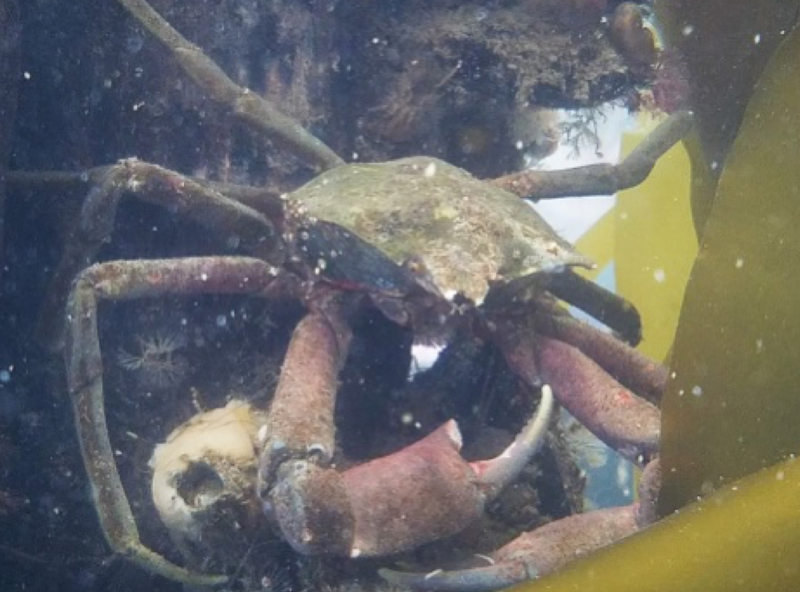 Northern kelp crab. Photo by Bobbee Davidson. Northern kelp crab, sea urchins and abalone feed on the kelps. Rockfish – over-harvested for years – can thrive in its blades. Feather duster worm, common on pilings. Staff photo. Living in the kelp forest tank at the main entrance to the aquarium is the newest arrival, Eleanora, a giant Pacific octopus. ‘Nora is the subject of The Octopus Learning Project, which will be described in a later blog posting. In the meantime, here's a wonderful article on PTLeader.com. Pilings, piers, and docks are found everywhere along developed coastlines. In many areas they dominate natural habitats, yet marine animals have found ways to make these artificial structures their homes. A river otter finds food and refuge under the PTMSC dock. Schooling fish, such as shiner perch and young walleye pollock, shelter in the shadows. Anemones, limpets, barnacles, mussels and plumose anemones attach to the hard surfaces. Spaghetti worms and burrowing sea cucumbers tuck into crevices. Many wood pilings contain creosote, a toxic chemical cocktail of polycyclic aromatic hydrocarbons (PAHs), phenol and creosols. Throughout the Salish Sea there are efforts to replace old piers, docks, and pilings with environmentally friendly structures. Water slows as it enters the bays, inlets and estuaries of the Salish Sea, depositing fine sediments -- mudflats and sand beds -- that cover the gently sloping seafloor. 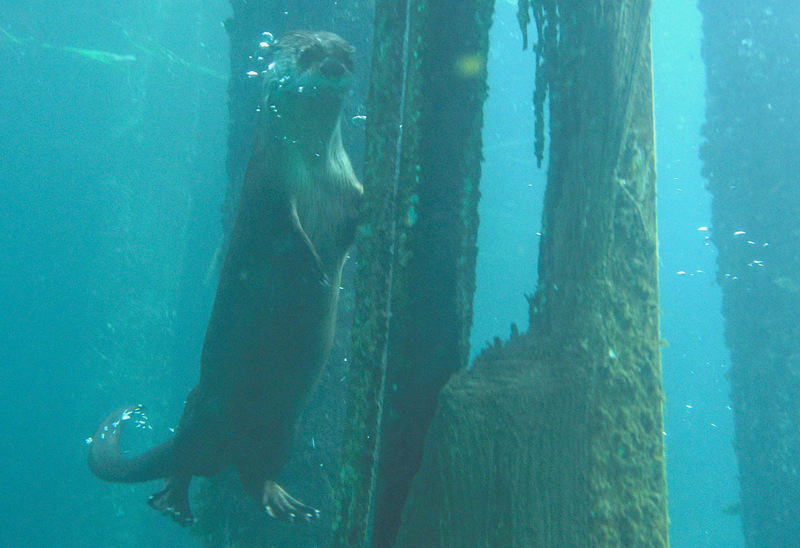 Sole and flounder seek out worms and crustaceans, while they, in turn, are a common food of the river otters within Fort Worden – which are sometimes visible on the aquarium dock. These fish can be viewed in aquarium’s tidal flats tide pool, along with sand dollars (closely related to sea urchins), which have very short spines and tube feet and feed on plankton and detritus. Historically, the Salish Sea’s estuarine mudflats were once dominated by the only oyster native to the Pacific Northwest: the Olympia. Pacific oysters, native to Asia, have now replaced them as the most harvested species. However, with renewed commercial interest and habitat restoration efforts, Olympia oysters are making a comeback. The newly built conservation lab -- constructed with funding from an Aquatic Lands Enhancement Account grant from the Washington State Department of Fish and Wildlife and the support of many volunteers -- showcases citizen science projects, special programs and exhibits in a demonstration area. microscopic life to inquisitive minds! Staff photo. The lab is home to the current Pinto Abalone Project. Pinto abalone are marine snails once found in abundance in the Salish Sea. Over-harvested for decades, their population is now too small and spread out to successfully reproduce. The PTMSC has partnered with the Puget Sound Restoration Fund to raise pinto abalone to help determine the best way to reintroduce these remarkable creatures into the wild to ensure their recovery. A future blog posting will describe this project in more detail.